Carpet cleaning is essential for every home more so if you have pets and children since dirt and grit accumulated on it can lead to allergies and illnesses. In recent years, carpet cleaning methods have evolved and now you can choose from various water based and dry cleaning methods. Both types of carpet cleaning methods have their own positives and negatives and you have to choose a service that will suit your requirements based on budget, carpet type and situation of stains. In the wet method too, there are different options you can choose like steam cleaning or hot water extraction method, foam extraction method and rotary shampoo method, in which hot water is sprayed with chemicals into the carpet and then immediately vacuumed out. 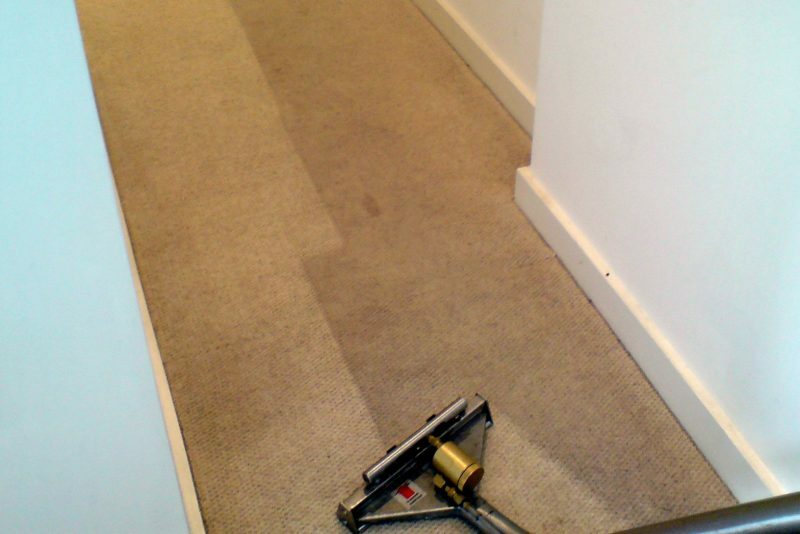 In dry extraction carpet cleaning, chemicals are sprayed unto the carpet to bond with soil and dirt particles, which are then vacuumed out of the carpet. When you use the wet cleaning method, it will take a few hours for your carpet to become completely dry depending on the amount of water used. You may not be required to remove furniture while the carpet is getting cleaned, but using plastic pads under furniture legs will protect it when the carpet is drying out. Wet carpet cleaning is most recommended, as it provides deeper cleaning and removes even the most stubborn stains. Hot water extraction and steam cleaning are two common wet carpet cleaning methods, during which equipment is used to spray hot water or steam with cleaning chemicals onto the carpet. Hot water extraction method for carpet cleaning can be used on all kinds of carpets as long as most of the water is extracted out of it after cleaning. Ensure that your carpet is completely dry after you carry out wet carpet cleaning as otherwise there are chances of mold and dust gathering on it. During the shampoo and foam extraction methods, cleaning solutions are inserted into the carpet by machines and then cleaned out through wet vacuuming. Most dry carpet cleaning methods focus on chemical-based cleaners with minimal use of moisture to scrub off stains. Chemical mixtures are sprayed onto the tough stains and then on lightly across the carpet so that they absorb all the dirt and grime, which turns into crystallized power. The entire carpet is then vacuumed from end-to-end to ensure that all the dirt has been cleaned up. Though this method allows you to use the carpet immediately and is much cheaper than wet technique, it is not preferred by some house owners as it is not as effective and only cleans up the outer layer of the carpet.